Last Lap: Championship Four....times Three! NASCAR turned up the excitement for Ford Championship Weekend as they introduced a Chase format for the XFINITY and Camping World Truck Series! This year you will see a set of Championship 4 drivers each day of the weekend as they battle on equal footing for the title. Today's announcements by NASCAR Chairman and CEO Brian France featured several major and important changes for the 2016 season. The NASCAR XFINITY Series and NASCAR Camping World Truck Series will implement seven-race, three-round Chase formats with unique characteristics but very much in the same spirit of the Chase for the NASCAR Sprint Cup. The seven-race NASCAR XFINITY Series Chase will begin at Kentucky Speedway on Sept. 24, and feature 12 drivers and two elimination rounds, with four drivers competing in the Championship 4 at Homestead-Miami Speedway on November 19. The four drivers who advance to the Championship 4 at Homestead-Miami Speedway will have their points reset to 4,000. The highest finishing Championship 4 driver will be crowned the NASCAR XFINITY Series champion. 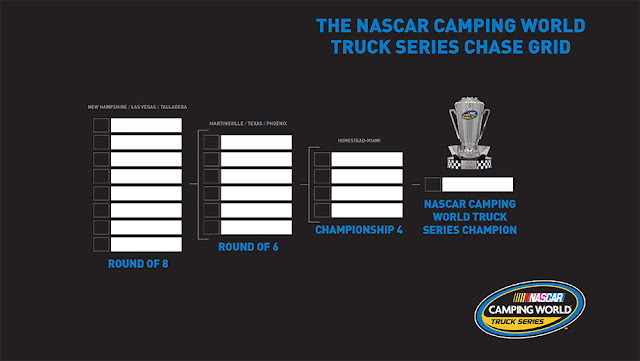 The seven-race NASCAR Camping World Truck Series Chase will begin at New Hampshire Motor Speedway on Sept. 24. It will feature eight drivers and two elimination rounds, with four drivers competing in the Championship 4 at Homestead-Miami Speedway on November 18. A win in the first 16 races all but guarantees a driver entry into the NASCAR Camping World Truck Series Chase, provided that the driver is in the Top 30 in points and has attempted to qualify for each race. The four drivers who advance to the Championship 4 at Homestead will have their points reset to 4,000. 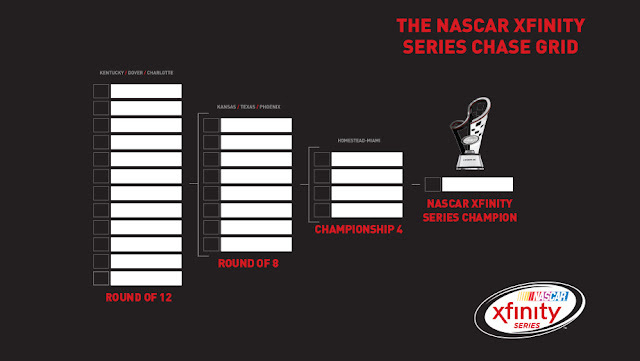 The highest finishing Championship 4 driver at the Ford Eco Boost 200 will win the championship. The 2016 Ford Championship Weekend will take place November 18-20 at Homestead-Miami Speedway.